Whether you are looking for a beach holiday, a city break or a rural retreat, visitors can expect good weather throughout Thailand for most of January. It’s a month which sees the tourist high season in full swing with visitors arriving in Thailand in search of winter sun. This surge in arrivals means it is advisable to book accommodation in advance, particularly if you are heading to the islands or a beach destination. Visit almost anywhere in Thailand during January and the chances are high that you will encounter excellent weather with plenty of sunshine and clear skies. There is still the possibility of isolated rain showers, particularly in the first half of the month, but average amounts of rainfall are low all around the country during January. It’s the middle of the cool season in Thailand which means that humidity is lower and temperatures not as stifling as they can be during other months. 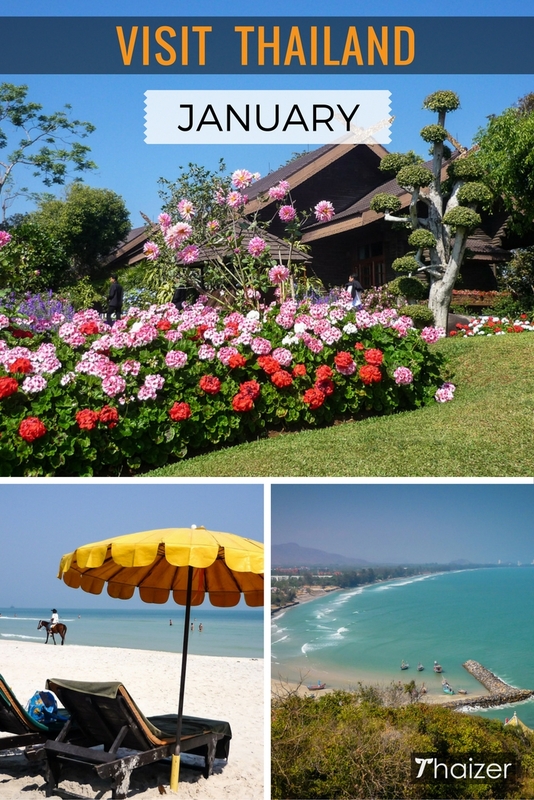 January is an excellent time of year for nature lovers to explore the Thai countryside and see the flowers in bloom. The cool season weather does mean that evenings can get surprisingly chilly in the north and north-east of Thailand. This is especially true in the mountains and rural areas so be prepared with some warmer clothing. Which is the best Thai island or beach resort to visit in January? The weather in January is generally good on all of Thailand’s islands and beach resorts with extended hours of sunshine. The average rainfall statistics show less rain on the Andaman Coast (e.g. Phuket, Krabi) compared to the Gulf Coast (e.g. Ko Samui, Ko Tao). Isolated showers are more likely to occur in the first half of the month, but the amounts aren’t significant enough to rule out any destinations so just choose an island or beach resort you like the look of. The arrival of the New Year on January 1 marks the first of three New Year celebrations in Thailand. The exact date for the second celebration, Chinese New Year, varies from year to year but falls in either January or February. Although it isn’t a national holiday in Thailand, there are many Thais with Chinese ancestry who do celebrate the occasion. The third and biggest celebration is Songkran, the Thai New Year Water Festival, which is celebrated with gusto in April. Although Thailand now uses the Western calendar, it does so alongside the traditional Thai calendar. The Thai calendar is 543 years ahead of the Western calendar because it is based on the year that the Buddha died and entered Nirvana which is believed to be 543 B.C. This means that in Thailand, the year 2017 may also be shown as 2560 B.E. (Buddhist Era). New Year’s Eve and and New Year’s Day are public holidays in Thailand. The New Year holiday sees an increase in traffic on the roads with buses, trains and internal flights busy too. If travelling over the New Year period, it’s advisable to book transport and accommodation in advance. The second Saturday in January is designated as Wan Dek (Children’s Day). The exact date for Chinese New Year varies depending on the lunar calendar, but falls in either January or February. Hosted annually in the village of Bo Sang just outside of Chiang Mai city, the Bo Sang Umbrella Festival is usually held over the third weekend in January. An excellent evening of free entertainment courtesy of the Bangkok Symphony Orchestra. The outdoor concert season starts in December and continues through until February.